The children in assembly heard at first hand that learning never stops - even if you are a grown up. We have made a commitment at Manor to give young people in Uckfield training and employment opportunities through the national apprenticeship scheme. 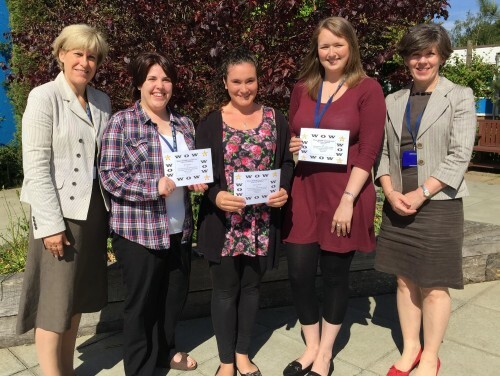 This year, three young people completed their NVQ Level 2 in Supporting Teaching and Learning. Rebecca Miller, Erin Wickson and Hannah Fry were presented with WOW certificates in assembly for all the children at Manor to see. Erin and Rebecca are both past pupils and it's great that we have been able to play another part in their continued education. We work closely with local company Campus Training, who are the training provider and the apprentices work alongside experienced teaching assistants to gain the practical experience to support the course. Now they have completed their apprenticeships they are well placed to apply for teaching assistant and similar jobs across East Sussex. Some of you may have already met Esme Brooks, who has joined us recently as our Business Administration Apprentice. We have every confidence that she is going to be as successful as Rebecca, Erin and Hannah.